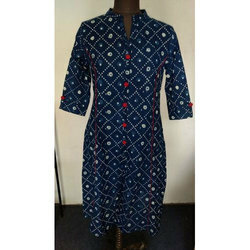 Our range of products include doule layer rayon jaipuri kurti, block printed cotton kurti, dabu kashish kurti, designer kurti, block print kurtis and dabu putai print kurti. Double layer embroidered kurti in high quality rayon fabric. 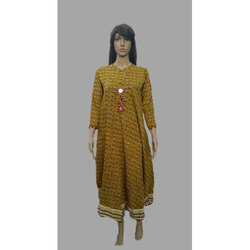 We have earned immense reputation since our establishment by providing the best quality of Dabu Kashish Kurti. It is ideal for both general use and special occasions. As a quality focused name, the quality of these products is never compromised as per industry laid norms. 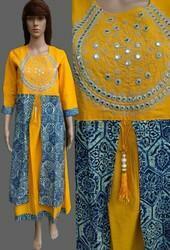 With diligence, our reliable and quality oriented organization has been engaged in providing Designer Kurti. Ideal for both parities and other special occasions, these are designed in accordance to latest machinery and as per latest market trends. It is available with us in various sizes and colors. 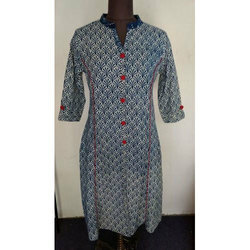 Being a quality centric enterprise of this domain, we are affianced in offering the best quality of Block Print Kurtis. Available with us in various sizes and colors, the offered products are ideal for both special occasion and general use. It is designed by using the best quality fabrics and as per market trends. 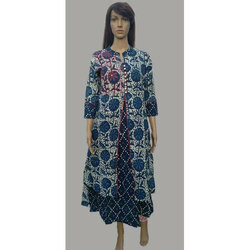 Having enormous knowledge in this sector, we are engaged in offering a premium quality Dabu Putai Print Kurti. It is used for general use and special occasions. Checked on various quality assurance procedures, the quality of these products is never compromised.